Summer is knock-knock-knocking on your door and she’s brought some guests: Frozen Desserts! Ice Cream is great, but what about the often over-looked cousins? I’m talking about ices, pops, paletas, and raspados? Recently, we were exploring the South Pasadena Farmers Market and came across Carmela Ice Creaam. This unique little creamery located in Pasadena has some delicious ice cream and some amazing sorbet. Some of our favorites included the Lemon Basil, which is perfectly refreshing, and the Spiced Strawberry, which is made with balsamic & a little black pepper that makes your mouth tingle. A single employee was manning the booth solo, but was kind enough to let us, and many other folks, sample nearly every cool treat on the menu. With a growing line, we happily retreated to the shade to enjoy our Carmela sorbet. Our favorite Carmela ice cream is the Aztec Chocolate that also has a nice chipotle kick. 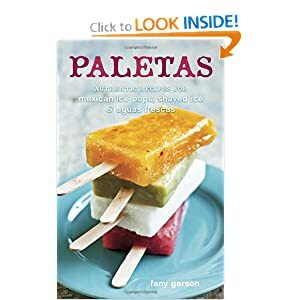 Since we’re talking frozen desserts, I have to mention the new book by one of my favorite Mexican Chefs, Fany Gerson, titled: Paletas:Authentic Recipes for Mexican Ice Pops, Shaved Ice & Aguas Frescas. I’ve mentioned both before, but now that the book has been released, I must share with you what this slim volume can do for you. Not only does Gerson teach us how to whip up batches of blueberry or pineapple flavored frozen treats, she takes it to the next level with tempting flavor combinations like mango-chile and dulce de leche. The recipes in this book will keep you cool all summer long. Take this weekend to check out Carmela in Pasadena, or go buy Paletas by Fany Gerson and try one of her frozen creations or get creative and make one of your own. Still need more encouragement? Check out Bon Appetit’s article, “What People are Cooking: Frozen Desserts!” Watermelon Granita…yum!